There's been lots of talk lately about diamond fringes -- see here for our discussion of the various fringes owned by the Grimaldis of Monaco -- and for good reason. Nearly every royal family has at least one, in part because they became incredibly popular during the second half of the nineteenth century, a fashion started by the imperial court of the Romanovs. Today, we're taking a second look at the jewel collection of Princess Louise, daughter of King Edward VII and Queen Alexandra and wife of the 1st Duke (and 6th Earl) of Fife. Let's have a gander at the diamond fringe that belonged to this British princess, shall we? The convertible diamond fringe necklace/tiara was one of Louise's many wedding gifts in 1889. We talked about the most impressive tiara from among those gifts, the present from her new husband, here. 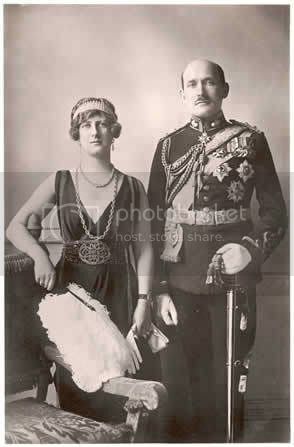 (You can see her wearing the Fife tiara with the fringe as a necklace in the photograph on the left.) Although some sources, including Munn's major book on tiaras, incorrectly state that the Fife tiara was a gift to Louise from her parents, it was actually this diamond fringe that was presented to her by Bertie and Alexandra (who were then the Prince and Princess of Wales). Contemporary news reports described the piece as "a flexible tiara of diamonds" . We know that the piece was made by Hancocks, a London jeweler, thanks to additional reporting from the period. Ursula has excerpted reports on the wedding from the Graphic, which devoted an entire special issue to the Fife nuptials. The publication describes the fringe as being "of elegant design of alternating and graduating rays, varying from nearly two inches long in the centre to half an inch at the extreme ends." Additionally, they call the piece "a superb tiara of lovely brilliants of chaste design," noting, "the rays of diamonds being nearly two inches long in the centre, and graduating downwards towards the ends, while each alternate ray has a pretty tapering effect, which materially adds to its beauty" . Commentary from the Graphic also connects the fringe tiara to its Russian inspiration: "The tiara is a very large one, and is so flexible that it can be bent upon the hair to suit any style of coiffure, and can also form a necklace. The design is Russian, consisting of straight lines, but the jewellers have secured considerable lightness of effect by the introduction of slender lines between the taller ones" . The Illustrated London News emphasized the tiara's connection to Louise's parents: "The Prince and Princess of Wales presented their daughter with a beautiful tiara of fine brilliants, of elegant design of alternating and graduating rays, varying from nearly two inches long in the centre to half an inch at the extreme ends. By a simple arrangement it also forms a beautiful and graceful necklace." Louise was photographed wearing the fringe as a necklace on multiple occasions (including the two pictures above); she also wore the piece as a tiara. And she wasn't the only Fife lady to be pictured in the fringe tiara. 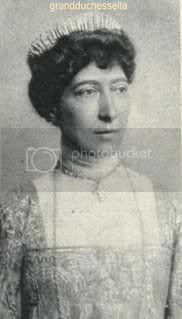 Her elder daughter, Princess Alexandra -- who inherited the Fife dukedom in her own right in 1912 -- was photographed wearing the tiara. 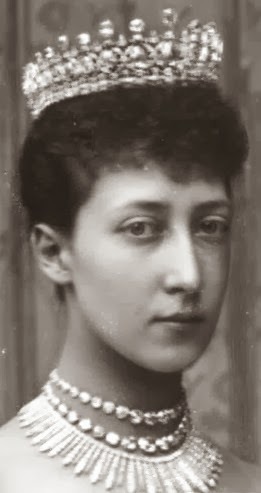 In the portrait, which also includes her husband (and, ahem, first cousin once removed) Prince Arthur of Connaught, Alexandra wears the fringe as a bandeau, settling the piece low across her forehead. Whether or not Alexandra owned the tiara herself or borrowed it from her mother (who would still have been alive at the time the portrait was taken) is less clear. 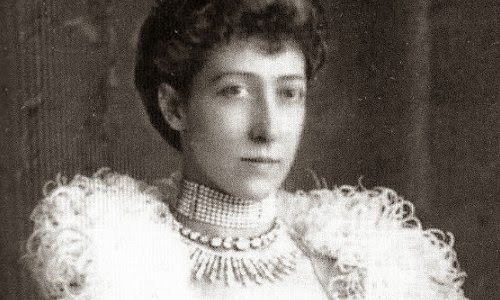 Alexandra did inherit another major tiara from her mother -- the Fife tiara -- and then subsequently passed it along to her nephew, James Carnegie, the 3rd Duke of Fife, who also inherited his aunt's titles. Whether the fringe took a similar path isn't certain. If Alexandra's sister, Maud, inherited the fringe, however, it would likely also have ended up with James. He was her only child, and he's the only surviving grandchild of Princess Louise, so it seems likely that if the fringe is still in the family, it may be with him or one of his descendants. As always, if anyone has any more information that could illuminate the current whereabouts, please let us know in the comments! 2. Cropped version of an image in the public domain due to age. 3. See the full report from the Press here. 4. See more of the report from the Graphic at Ursula's site. 5. Text from the Illustrated London News available at Ursula's site.